I was walking down my little town’s main street yesterday afternoon with a friend, and I noticed that golden light that comes only in the early autumn – it’s an amber that washes everything with warmth and coziness. Looking down at the brick pathway, there were a few leaves that have fallen, and I realized: it’s really here. We’re in full autumn swing now, and the kids and I are feverishly planning Halloween costumes and my son’s birthday, which is just around the corner. And with life being just so full right now, the timing couldn’t be more perfect for me to share a recipe from my friend Kathy Strahs – you may know her from Panini Happy. Not only has Kathy started her own publishing company, Burnt Cheese Press, she is launching a new cookbook today, The 8×8 Cookbook: Square	Meals for Weeknight Family Dinners, Desserts and More—In One Perfect 8×8-inch Dish, which is full of recipes that are perfect for busy families. The idea behind the book is pretty smart — when you’re feeding a family of 4-6, all you really need is a simple 8×8 baking dish. I love the idea of saving the large 9×13 pans for the bigger gatherings – this way of cooking is definitely more practical and in line with the way we eat! 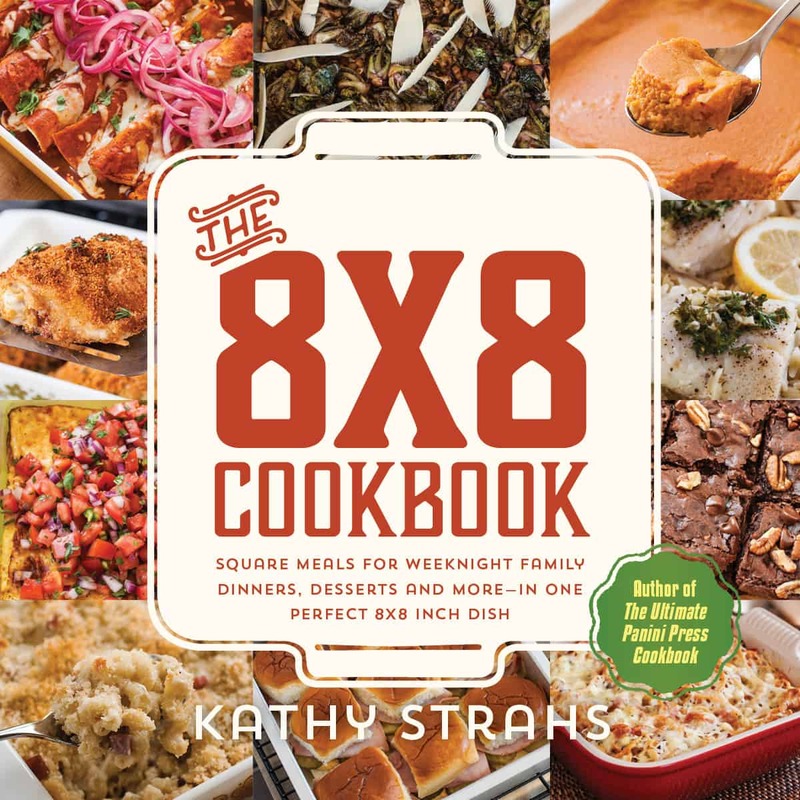 I couldn’t be more happy to help Kathy as she releases The 8×8 Cookbook, and launches a month-long crowdfunding campaign on Kickstarter.com today. To celebrate the launch, I am excited to join the 8×8 Blog Potluck where our blogging friends are sharing a recipe from the book. This Greek-Style Sausage and Peppers was a no brainer for me. All the ingredients we love are in a perfect 8×8 square! 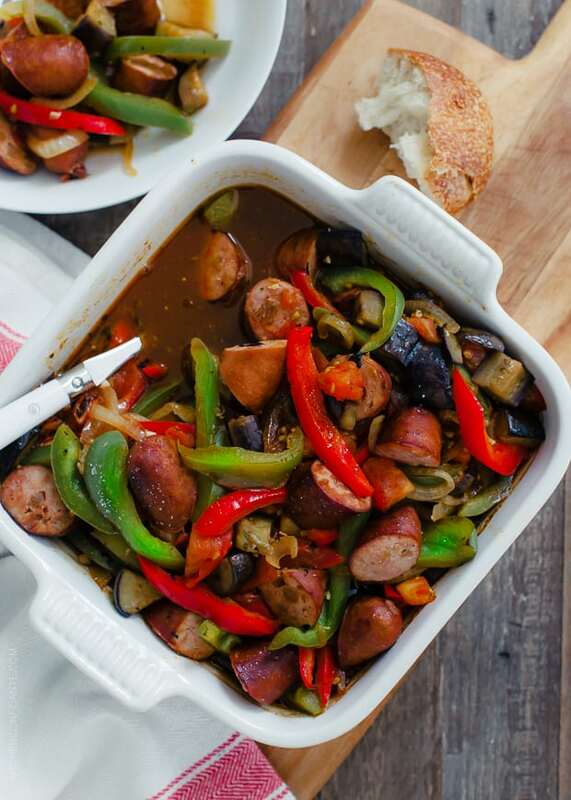 Eggplant and peppers, along with sausage (we prefer spicy, but you can tone it down for your family, as Kathy has) are simmered in a zesty tomato sauce, perfect for these fall weeknights when we are craving something simple and hearty. Be sure to check out all the wonderful recipes in today’s 8×8 Potluck (see the list below), and I hope you consider supporting the cookbook’s crowdfunding campaign on Kickstarter.com, where you can back the project and get signed copies of the book, Kathy’s daughter’s “How to Make Mac ’n Cheese” graphic tee, and other rewards. Please visit these wonderful blogs to see what they made from The 8×8 Cookbook! Find out more about Kathy’s book on Instagram, Facebook, Twitter or by following the hashtag #8x8Cookbook. When friends from other countries share their traditions with me—particularly those I can eat—I feel so fortunate. My friend Eleni, an investment adviser and mom of two adorable little girls, was born and raised in Greece and has a wealth of amazing Greek recipes. She is the one who first introduced me to spetzofai—a Greek sausage and peppers dish, simmered in a zesty tomato-based sauce. It’s traditionally a spicy dish, made with spicy sausages or peppers, but I dial down the heat for my family by choosing milder ones. Be sure to make a big pot of rice to soak up these incredible fresh flavors. -- By Kathy Strahs, from The 8x8 Cookbook: Square Meals for Weeknight Family Dinners and More--In One Perfect 8x8 Inch Dish (Burnt Cheese Press, 2015), reprinted with permission. This was an instant hit with my family -- since we love bold and spicy flavors, we love it with spicy sausage! Reduce the heat to medium. 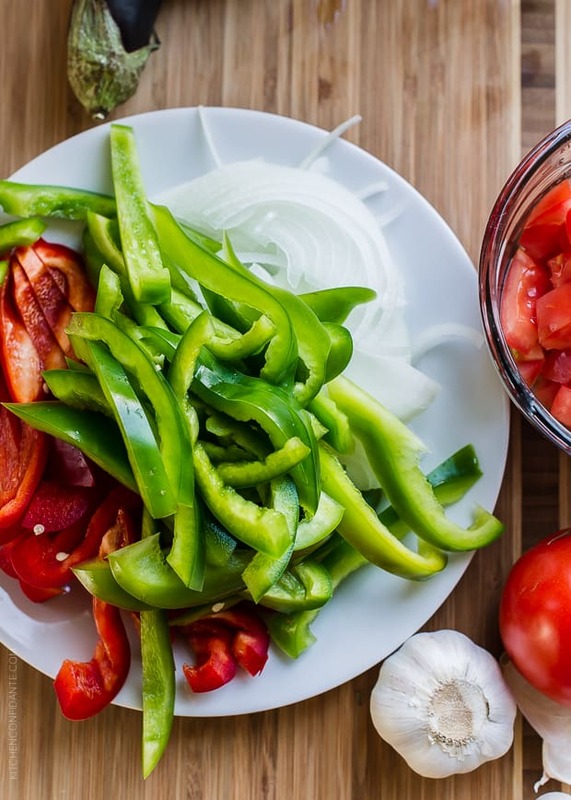 Add the onions and peppers to the same skillet and cook them, stirring occasionally, until they’re tender, 8 to 10 minutes. 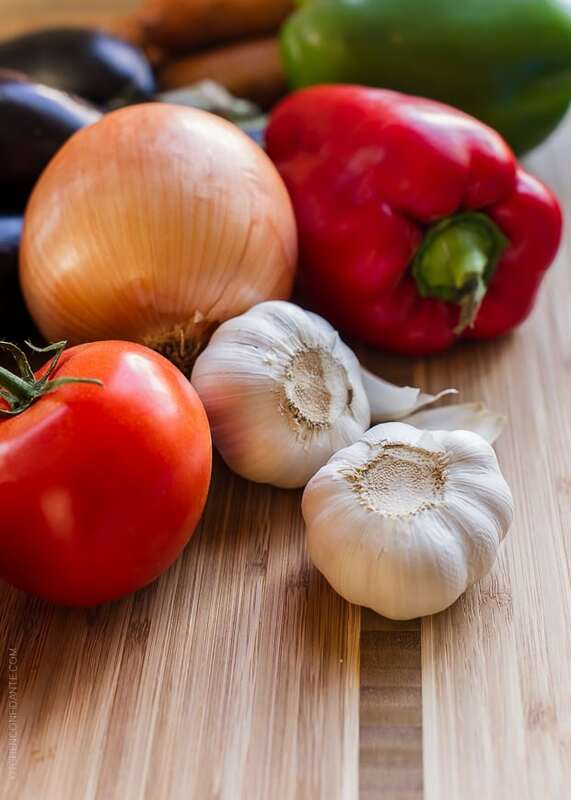 Transfer the vegetables to an 8x8-inch glass or ceramic baking dish. Kathy Strahs, from The 8x8 Cookbook: Square Meals for Weeknight Family Dinners and More--In One Perfect 8x8 Inch Dish (Burnt Cheese Press, 2015), reprinted with permission. Umm, yumm. Gotta make this for the fam! Isn’t funny how we forget those little things about the changing seasons. Definitely starting to notice them again. 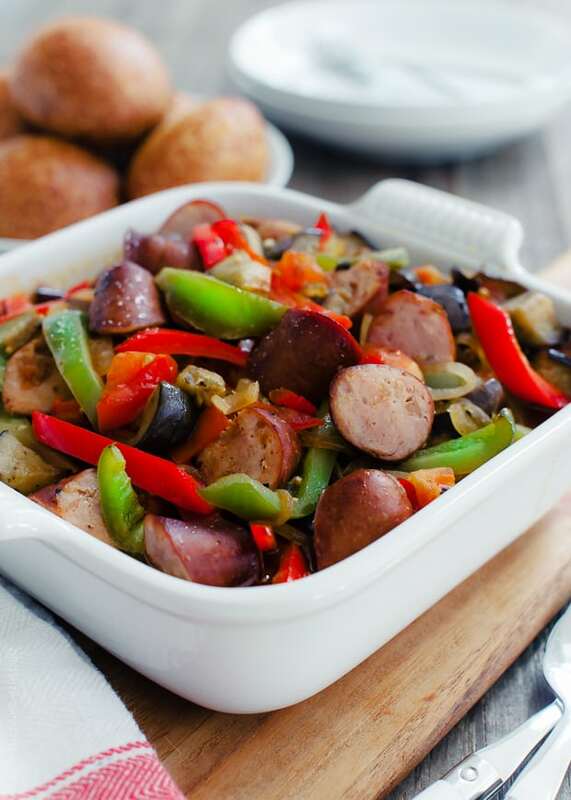 This sausage and peppers dish would be a huge hit with the husband. It’s perfect for a cool autumn day, right? Thank you so much for all of your support, Liren! Your photography here is absolutely gorgeous. I love Kathy’s concept! And 8 x 8 would feed my husband and me for 2 nights—perfect! 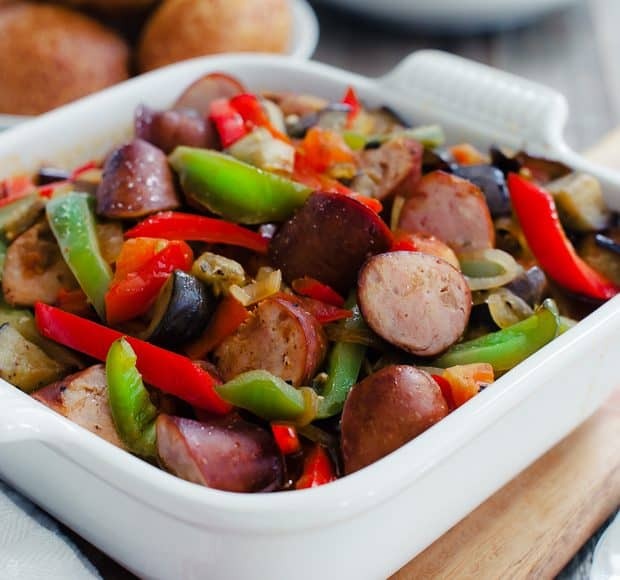 As is this fabulous Greek sausage and pepper dish!